Yuriy Danilovich, also known as Georgiy Danilovich was Prince of Moscow (1303–1325) and Grand Prince of Vladimir. Andrey III Alexandrovich, a Russian prince, son of Alexander Nevsky, received from his father the town of Gorodets on the Volga. 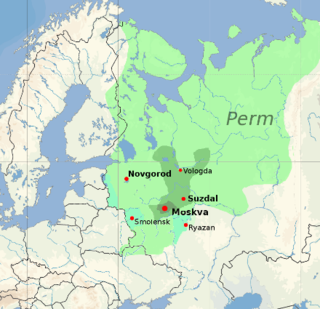 In 1276 he added Kostroma to his possessions and joined the struggle for the Grand Duchy of Vladimir-Suzdal. Danilov Monastery is a walled monastery on the right bank of the Moskva River in Moscow. Since 1983, it has functioned as the headquarters of the Russian Orthodox church and the official residence of the Patriarch of Moscow and all the Rus'. Dmitry Alexandrovich was Grand Prince of Vladimir-Suzdal from 1276 until 1281 and then from 1283 until 1293. The Feodorovskaya Icon of the Mother of God, also known as Our Lady of Saint Theodore and the Black Virgin Mary of Russia is the patron icon of the Romanov family and one of the most venerated icons in the Upper Volga region. Her feast days are March 27 and August 29. Vsevolod Mstislavich, the patron saint of the city of Pskov, ruled as Prince of Novgorod in 1117–32, Prince of Pereslavl (1132) and Prince of Pskov in 1137–38. Maria Shvarnovna was the first wife of Vsevolod III Big Nest, and gave birth to at least 14 children. Four of her sons, Konstantin, George, Yaroslav and Sviatoslav, succeeded their father as Grand Princes of Vladimir, and Yaroslav went on to become Grand Prince of Kiev around the time of the Mongol Invasion. As Yaroslav's mother, she is thus the paternal grandmother of Alexander Nevsky, whose son, Daniel of Moscow, founded the Muscovite branch of the Rurikid Dynasty. Xenia of Tarusa, also known as Kseniya Yurievna, was a Princess consort of Tver and Grand Princess consort of Vladimir from 1267 to 1271. She is counted among the saints of the Russian Orthodox Church.